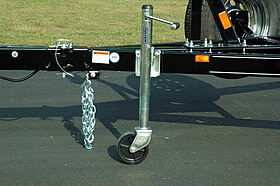 The entire trailer is fully welded for strength and durability. 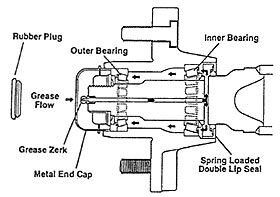 Axles are equipped for complete bearing lubrication without removing the hubs. All bolt on couplers, winches and brake actuators are plated for additional corrosion protection. Standard steel rims are first powder coated and then clear coated to retard corrosion and maintain appearance. 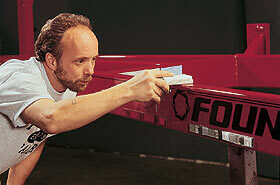 Custom colors of Premium Acrylic Polyurethane paint and primer assure a beautiful long lasting high performance finish. 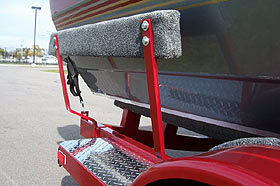 Aluminum diamond plate is used on top of all tandem and tri-axle fenders. Marine grade pressure treated wood is used for durability. Marine grade color coordinated carpet enhances appearance. 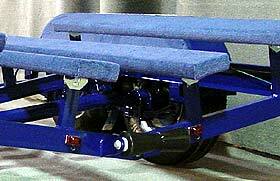 Side guides are standard on all single axle models to assist loading. Custom color pinstripes are painted and coordinated with custom Graphics. The 3-year structural warranty is the best in the industry.